What Next in Nifty - Post Election Results? It appears that Modi magic is doing the wonders as their campaign had even caught with the children "Aab acche din aane wale hai" and we could see children rhyming it like a song. Thus it is very important that a story need to get struck with the people to create a wave effect and this time Modi has beeen able to achieve the same by his charismatic style sidelining the 'Bhishma Pitamaha' of BJP i.e. Advani. Finally as predicted by us earlier way before Modi rally started back in Feb 2014 that Nifty going to touch 7000 mark and same has happened today and now we can say that markets have priced Bharatiya Janata Party winning 230 seats in the ongoing elections. We estimate that Nifty can gain upto 5-10 percent over one month in Indian shares provided BJP gets 230 mark, while a number above 240 seats would spark 15-20 percent gains in the stock market. By contrast, should BJP and allies clinch less than 200 seats, and thus we see a correction to the tune of 15-20 percent over the next month. A stable govt would give rise to a momentum in cyclical sectors such as financials, industrials and infrastructure and thus one can keep an eye on Larsen & Toubro Ltd , Axis Bank Ltd , State Bank of India, Adani Port and Special Economic Zone Ltd and IRB Infrastructure Developers Ltd. However as a word of caution is that the first sign to exit from the market is, if it breaks the level of 6850 and another significant support break of 6650 is a sure sign to exit from the market and book the profit. 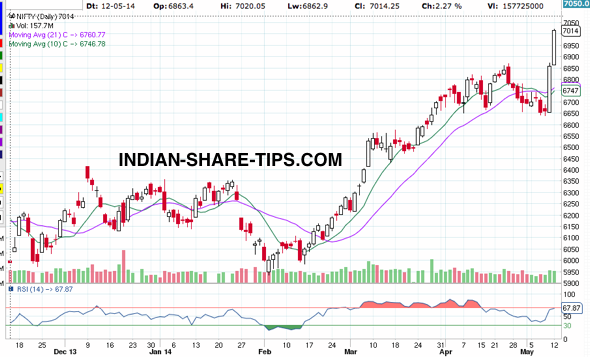 Remember to bookmark us for free stock market newsletter and get Nifty intraday tips which make money every day.